« Sutter Av station (L) Air Raid Siren lives! 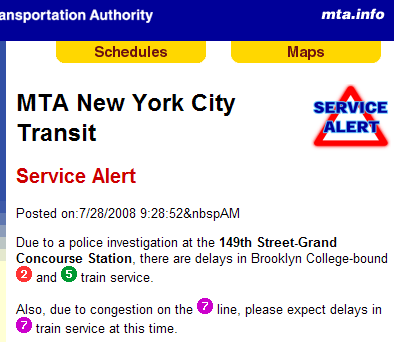 So bad, that MTA New York City Transit has issued a service alert for mundane “congestion” along the line. It must be really bad congestion! This entry was posted on Monday, July 28th, 2008 at 8:34 am	and is filed under subway. You can follow any responses to this entry through the RSS 2.0 feed. You can leave a response, or trackback from your own site.